Jensen are a big name in audio, and so it comes as no surprise that they too have entered the low cost turntable market. Whether or not their expertise will carry over remains to be seen. Let’s take a look. As is the case with the overwhelming majority of turntables at the entry level price range, the visual design of this device is fairly sparse, simple, and no nonsense in its approach. Indeed, the most notable element of the JTA-230s design is just how small it is. It’s incredibly compact, and the entire turntable is barely larger than the area of the vinyls it plays. In fact, the vinyl spills over the edges slightly which creates a rather nice effect. Available in six color combinations from a standard black to a garish gold, Jensen have clearly put some thought into the customization options which consumers respond to. The fact that you can choose from a comparatively wide range of options means that there will almost certainly be one variation which works well for you and sits appropriately within whichever environment you wish to use the turntable in. 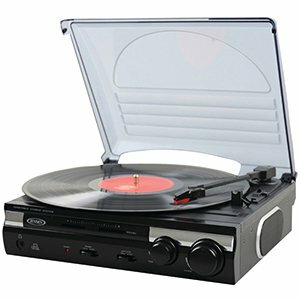 This belt driven, stereo turntable allows for three different playback speeds at the usual gradations of 33, 45, and 78 RPM. This flexibility is only added to by the inclusion of a pitch control for, as the name would suggest, adjusting the pitch of playback on the fly. One feature which many other turntables at this price range do not include is the tone control dial, so it is nice to see that Jensen has gone the extra mile in this regard. An included aux jack means that you can plug in any compatible device in order to play music directly from your phone or laptop. An RCA output allows you to extend the quality of the listening experience by hooking up external speakers, amps, or other equipment as and when you need it. Finally, Jensen have included a USB port and accompanying cable which allows you to convert your vinyl records into a digital format. Software is included to assist with the process of recording, editing, and converting the audio, and the whole process is very easu to follow. Although the device is undeniably on the smaller side in terms of actual scale, the sound which it is capable of producing through its internal speakers is a lot more powerful than you might expect from such a compact product. That said, the built in speakers do leave something to be desired when it comes to accuracy, clarity, and nuance in the performance. The bass response, too, is lacking punch, and the overall effect will not be enough by itself to satisfy people who are used to a higher quality playback. That said, you can extend the experience by adding your own speakers, so this is something to keep in mind. The build quality of the device is not fantastic, and doesn’t feel especially sturdy or robust. This is not to say that it isn’t, but is more a question of perceptions and may influence the amount of use you actually give the turntable. On the plus side, all of the outlined features worked flawlessly, including the vinyl to digital conversion process which can occasionally be quite fiddly and in depth. It was quick, easy, and very simple to follow. Jensen have created an incredibly low cost device which comes packed with lots of features you wouldn’t normally find at this price. The trade off is that the native audio isn’t phenomenal, but this can be fixed with external speakers.